There are moments when I genuinely love the Second Amendment for the sole reason that it would allow me to end particularly miserable events in my life quickly and painlessly. This include going to the DMV, waiting in airport security lines, and witnessing a love fest on Twitter between Kanye West and Donald Trump. This is wrong on so many levels it is hard to know where to start. Firstly, there is the obvious wrongness of West, a hip hop icon who makes stunningly original music, sucking up to a racist bigot who refers to African Americans as “the blacks” and got elected off of spreading racist conspiracy theories about the first black president. 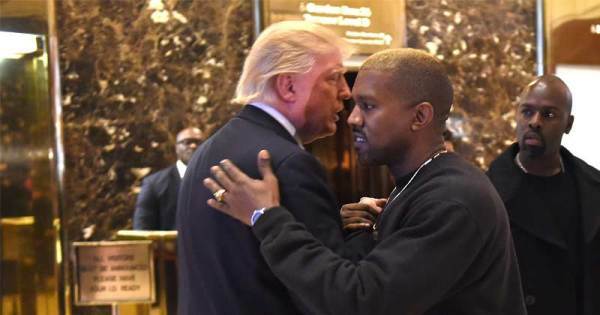 Kanye’s talk of being Trump’s “brother” and them both having “dragon energy” (which is clearly some sort of New Age code for a spiritual realm Kanye thinks he has gone to) only adds to the nausea, but it is Trump’s response that really tops it all off. Getting respect from a black person in America is about as rare as elephant eggs in Trump’s world, so the president responded with language he thinks “the blacks” are down with. Because you know, the blacks are “cool” and make good music etc etc. I’m not advocating anyone boycott Kanye, protest his concerts, or even troll him on Twitter. I would however, like him to know how sad this makes me and every sentient human being feel. It didn’t have to be this way, Kanye. It really didn’t.